SG6 Automatic Shutoff Generator with built in stirring motor to prevent agglomeration. Look no further. This is the best LVDC (Low Voltage Direct Current) ionic/colloidal silver generator you will find available in the world. No other generators have a stirring motor, a CONSTANT CURRENT regulator, automatic shutoff and variable PPM control. This generator attaches to any standard mouth glass jar or fits inside a wide mouth jar. It can produce a quart, completely automatically. The stirring motor and CONSTANT CURRENT is what really makes a difference. The silver atoms are separated as they leave the electrode and form a dense ionic cloud. By dispersing the atoms as they are being released, very little agglomeration occurs and the result is crystal clear and colorless ionic/colloidal silver of the smallest particle size. Comes with two sets of .9999. (99.99%) pure silver electrodes so you can make 100-300 gallons of ionic/colloidal silver before needing replacements. It also uses polarity reversing so the electrodes do not need to be cleaned between batches. The oxide is pushed off each reversal. They are self cleaning, not self polishing which is unnecessary to do. We also make the SG6-EURO model which can work on European voltage. Inside view of SG6 Auto. Why do we show the inside? Because we want you to see what we have. Most other manufacturers do not show because basically their units are nothing more than smoke and mirrors. Usually there's nothing inside competitor units except 3-nine volt transistor radio batteries or a transformer-rectifier unit to supply CONSTANT VOLTAGE. That is rudimentary. 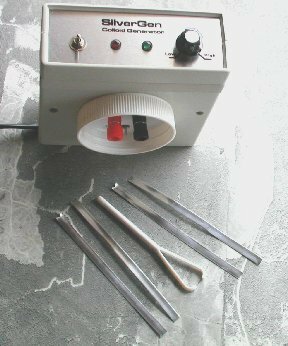 You need CONSTANT CURRENT to make good ionic/colloidal silver. We have it and other features too. Note the stirring motor and electronic circuitry. 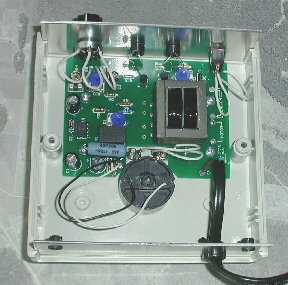 This unit contains a power transformer, diodes, bridge rectifier, transistors, capacitors, resistors, integrated circuit chip, relay, zener diodes and a stirring motor. This is the most sophisticated ionic/colloidal silver generator on the market for the price. It is also the only one guaranteed to make crystal clear ionic/colloidal silver without any color. Color is generally attributed to particle agglomeration unless it is from using mineralized water or a contaminated production vessel.